Let’s celebrate gardening for wildlife month by attracting birds, butterflies, and other backyard wildlife to your gardens. In this post, I share highlights from this National Wildlife Federation publication. Find this video on my Creative Living with Bren Haas YouTube Channel. Thank you for watching my video today. 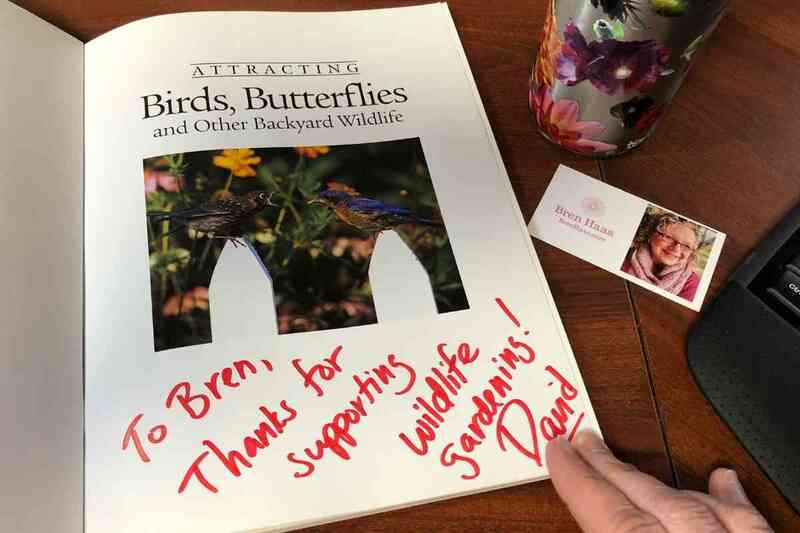 I hope you will consider purchasing one of your own from Amazon at Birds, Butterflies and other Backyard Wildlife by David Mizejewski. This book was a gift to me from the Author. I actually had the opportunity to interview him in person back in 2012 at a wildlife event. The book is a nice paperback measuring roughly 8″x10″. Color images and easy to read the text. 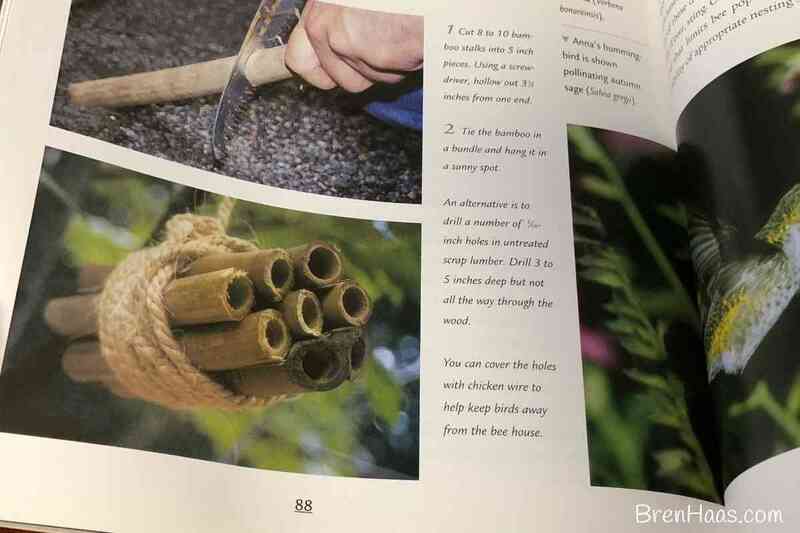 One of my favorite topics in the book is the section featuring easy to create family projects. There is even a how to create a birdbath out of a stump in your backyard! You will find creative ideas about container water gardens and dealing with the puddle and muddy areas. Lots of ideas for creating spaces in any size backyard for wildlife to take cover… including a really cool nest box project for the family to do together. AND I JUST ADORER the bee nesting house I use in my home garden! Designing your wildlife habitat is my second favorite section of the book .. it takes you step by step from assessing your property to what native plants to purchase in your zone! Your backyard can come alive with plants that welcome wildlife – everything from butterflies, songbirds and lively toads. 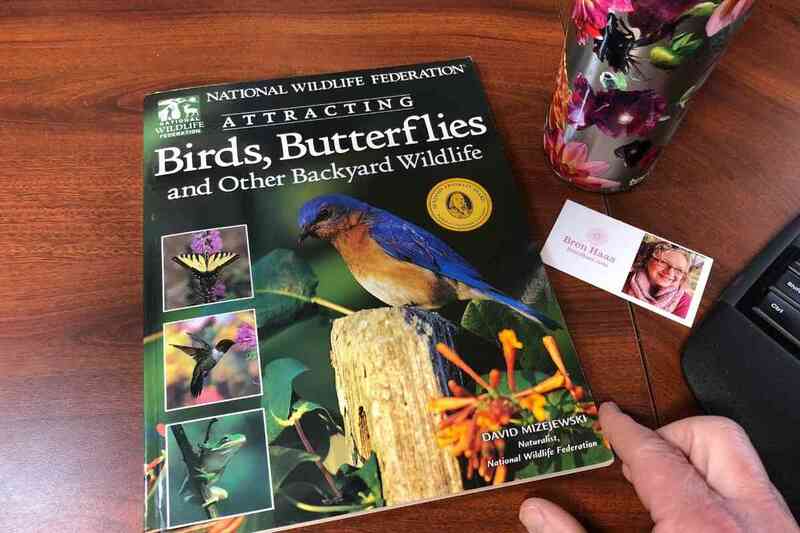 The book is perfect for all ages – National wildlife federations – Attracting Birds Butterflies and other backyard wildlife filled with over a dozen project for families to do together. Creative Education – for sure! Thank you for stopping by my site today. I hope you will take the opportunity to comment below or connect on my contact page featured on this site. My garden is not a Certified Wildlife Habitat, but I would like it to be. I have bird baths, food, and shelter for the birds and wildlife, though. Looking forward to tonight’s gardenchat! sounds like the chat will be filled with great information ??? We welcome wildlife to our Certified Wildlife Habitat gardens by planting and planning areas for animals and critters of all kinds. We plant flowers, plants, and veggies that promise a little for us and a lot for “them”. We leave areas of “muddy puddles” for the butterflies, bird houses at safe heights for the birds, and small hotels for the bees. We also offer activities for the peskier visitors by offering corn jingle bell feeders for the squirrels a safe distance from the food garden, and longer grasses for other animals to run and be camouflaged in a safe distance from the food garden as well. We leave up long foliage of grasses all winter for protection for birds and other insects and animals. We loved our Certified Wildlife Habitat gardens and hope to continue to learn and grow in the years to come! Other than my veggie garden the rest of my yard is a work in progress. I’m adding native plants to our yard and I’ve started a wild flower bed for our region. My garden is a certified wildlife habitat and I love seeing nature in the garden! I try to provide natural food sources for birds and other animals, as well as a water source. I am particularly fond of birds and butterflies, but I tolerate groundhogs who munch on my plants! My garden is not currently a Certified Wildlife Habitat. I did just pick up a mason bee home – so that’s a start, right?! I don’t know how you do all you do! So great! Not wildlife certified. I grow a variety of plants including fruiting shrubs and trees. Native plants for pollinators and birds keep my garden busy. As a city dweller it is a delicate balance between wildlife friendly and rat friendly. Also avoiding mosquito breeding. So no water is provided. Nearby park fountain will have to do. I have about 7 bird feeders, two water dishes, a huge 9′ overgrown shrub that draws bees and a large plate of bee water with rocks. Also hummingbird feeders and many pollinator friendly plants/flowers. I probably SHOULD be a wildlife refuge but I think having a ton of dogs might disqualify me on that! Or maybe QUALIFY me, who knows!? I love planting all kinds of plants to bring in insects! I love sedums for their late season blooms to feed the good bugs! Our gardens are not officially designated, but I would really like to make that happen this summer. We draw yellow finches with our purple coneflowers and butterflies with milkweed and butterfly bushes. Rudbeckia and coreopsis grow really well in our front perennial garden where our catmint is just packed with bees. Bird houses abound in my backyard. I plant with wildlife in mind. Love watching poly wogs turn into frogs in our tiny pond where Goldie the goldfish lives 3 seasons and one season inside our house. My little dog loves chasing everything around too! I have a mostly native landscape. I’m not certified but after tonight I probably will pursue that.